Marco Rubio: Ouch! Mark Levin Blasts Charlie Crist and Praises Marco Rubio as "Reagan-like"
Ouch! Mark Levin Blasts Charlie Crist and Praises Marco Rubio as "Reagan-like"
Conservative author and talk radio host Mark Levin "goes off" on current Florida Governor Charlie Crist for comparing himself to Ronald Reagan. Moderate republican Charlie Crist is running for the Florida US senate seat vacated by Mel Martinez. 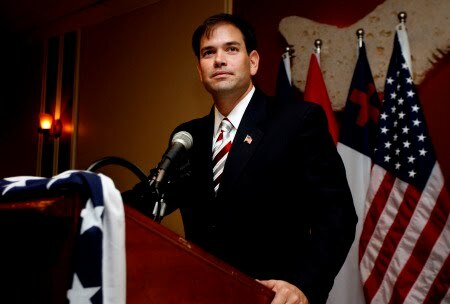 He is running against the more conservative former House Speaker Marco Rubio in the republican primary. Recently, Marco Rubio moved out to a 12 point lead. Crist has recently started moving towards the center and often trying to compare himself to former President Ronald Reagan. Apparently this does not sit well Mark Levin. Levin worked in the Reagan administration so I assume he knows of what he speaks. Levin believes that Crist is better compared to Arlen Spector and goes on to say that Marco Rubio IS Reagan-like.